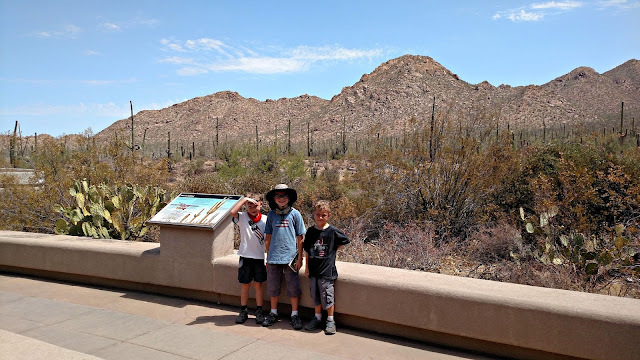 This is my last post to share from our trip to Tucson. 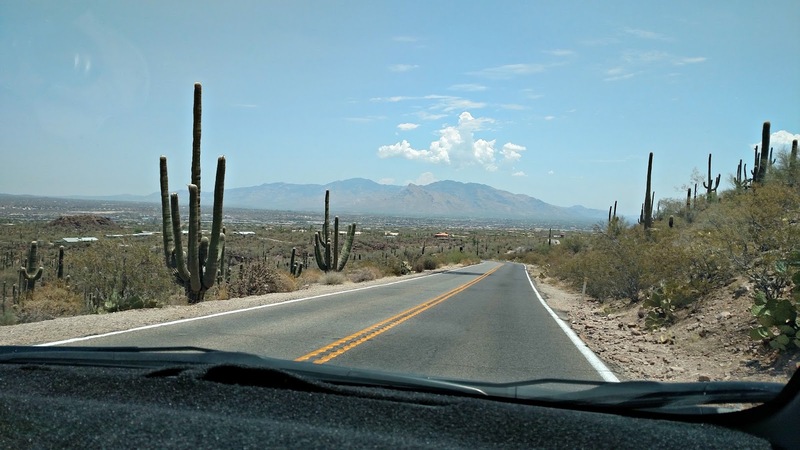 On July 4, after a visit to the Arizona-Sonora desert museum, we decided to drive through Saguaro National Park. I'm a huge fan of the national parks, and wish I could visit all of them. There are so many I haven't seen! Because Pierce was a 4th grader this past year, he had a pass to get himself and his family into any national park for free. Passport stamped. Then we went driving through some scenic loops. It was stunningly beautiful, and remote. We did see a couple of other cars out, but it didn't seem like a good place to break down! Hiking trails were everywhere, and I hope we can go back one day when it isn't quite so hot to check out some of them. 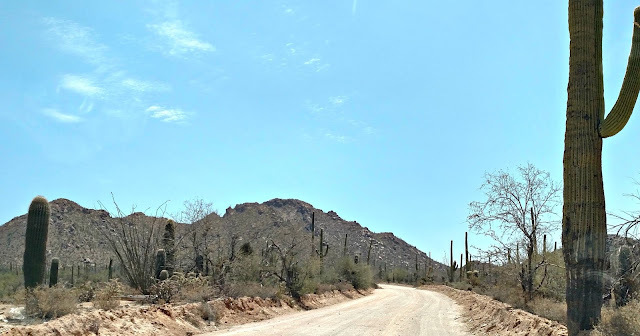 This dirt road came to a sign that said high clearance vehicles only, and we ended up turning around because we were in Paul's parents' Honda Fit. Definitely not high clearance! The rest of our scenic drive was on pavement, but certainly no less impressive in beauty. After all this fun, it was lunchtime. It was certainly a grand way to celebrate July 4th. I bet it was, but for me any time there is just fabulous, and I can bet the children were really enjoying it, unless it got a bit too hot, but then they usually can stand the heat! Some of these pictures almost look like another planet. What a great adventure. 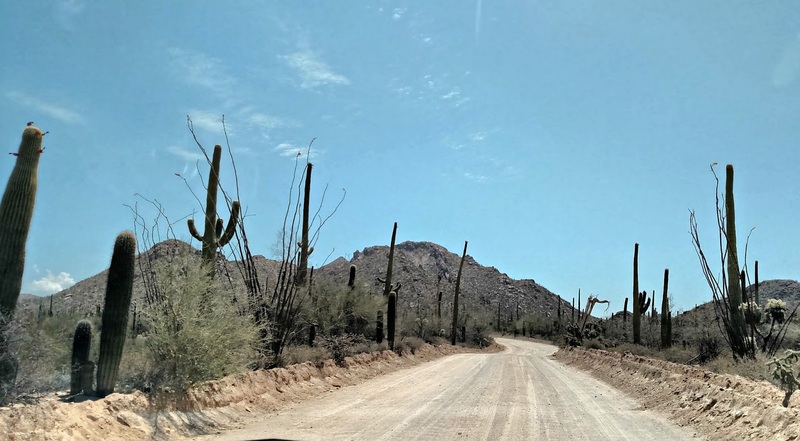 I would have loved seeing the birds in the cactus. This weekend, there was a senior special on the state parks, and my friend got a lifetime pass for any park, and she could take a carload each time if she wants. So glad you guys had a great trip. A favorite part of the country for my family! Just thinking about how hot it must have been has me fainting. Though lovely landscape! Have a great weekend. Neat! And Pierce gets to be a hero for having a pass! Didn't you tell me once you'd read some of Edward Abbey's books? I can't remember but I think so. You'd like "Desert Solitaire" if you haven't read it. What a beautiful place to visit! I bet you had an amazing trip! Beautiful! So glad you had such a nice time in Arizona. I went there, but it was when my oldest Mica was 2. He's now 12. I'd love to go again.